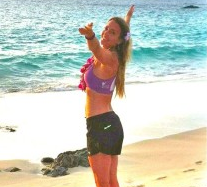 Source:The Garden Island Among the field of runners for this year’s Kaua‘i Marathon will be Julie Weiss —also known as the Marathon Goddess. Wiess will be running the event as part of her mission to run 52 marathons in one year, or a marathon a week in what she describes as “52 for You,” states a Kaua‘i Marathon news release. Source:Toronto Star, thestar.com She sounds grounded, intelligent and articulate over the phone, this 9-to-5, 42-year-old bookkeeper.Especially for a mother of two who bills herself as the “Marathon Goddess.” Especially for someone who is attempting to run 52 of those punishing races in as many weeks.But Californian Julie Weiss — whose Quixotic quest will bring her here this fall for the Scotiabank Toronto Waterfront Marathon — can tap a spiritual force to power her weekend runs. Tagged: July 2012 "Face of Hawaiian Energy Shotz"
Source:Hawaiian Energy Sports Julie is a runner with a mission – running 52 marathons in 52 weeks, in honor of her father Maurice and all the cancer warriors affected by pancreatic cancer. Through her love of running, love of life and love for her father she plans to raise hope, money and awareness to the world for those who have been affected by pancreatic cancer. Source:Northland’s News Center “I just know that I’m doing what I was put on this earth to do,” Julie Weiss said.Julie Weiss lost her father to pancreatic cancer in Nov. of 2010 and found her calling.”I didn’t realized how under -funded it was, and what a deadly disease it was,” Weiss said. “I thought, I’m going to do something big and make a difference. Volunteers from “Team Hope” a Pancreatic Cancer Action Network greeted Julie and her husband as they arrived at the Duluth International Airport. Read more.. Source:NBC News Some people run marathons to raise money for charity.One woman is running 52 of them to raise money for cancer research.Julie Weiss is a runner, with dozens of marathons and half-marathons from around the globe under her belt. This September, Weiss will be in Olathe for the Patriots’ Run. But no race has been more important than what’s ahead. “My goal is a million dollars. Can it happen? It can definitely happen. I totally got this.” Weiss said. Read more.. Source: NBC Hoping to help raise $1million to help fight pancreatic cancer, the “Marathon Goddess” is running 52 marathons in 52 weeks. KNBC’s John Cadiz Klemack reports. Read More..